Wednesday night, again at the Queen! Although this time hubby and I are among the crowd enjoying the night of the Fringe Wilmington Performance Preview Party. Among the many folks-about-town and dignitaries that packed the room of Upstairs Live, we were treated to the unique sounds of show starters, The Obsoleets. The ensemble, armed with a musical arsenal that includes guitars, drums, an upright bass, accordion, mandolin, violin, erhu (although not tonight) and more, was made complete by the conspicuously placed and remarkably integrated new member, DJ Leon Barton. It was, at first, an unlikely mix that ultimately made amazing sense. Playing rare and period selections (think 1920s Bessie Smith), they fused the tunes with Leon’s subtle yet genius scratchwork, creating a fabulous—dare I say, fringy—new genre. What is it? Low country, bluegrass, folk? Our next-door tablemates said it reminded them of the New Orleans music scene. Whatever they call it, I want to hear more of it in Wilmo! Onto the Performance Previews: There are more than 30 artists and 200 performances running at Fringe Wilmo now through Sunday, and each artist/group was able to give a 3-minute teaser of their performance at the preview. Some that struck my interest: A Contemporary Folk Evening with Flyground (Flyground, dance); One Word (MM2, dance); Dirk Darrow: NCSSI (Tim Motley, comedy/murder mystery); and No Diva Left Behind (Augustine Mercante, vocal & piano). Check them out on the website and go get your fringe on! In addition to main performances, tonight (Friday, September 23) there’s the Film Bros.’ Festival of Shorts at Theatre N; the Fringe 48-Filmmaking Competition; a Knights vs. Pirates Foam Sword Battle (ADULT & KID FRINGE? awesome!) in Willingtown Square, Saturday, September 24, from 2:00-5:00pm, thrown by our pal DÉminence Grise; and of course, the Visual Fringe exhibition at the Chris White Gallery at Shipley Lofts. 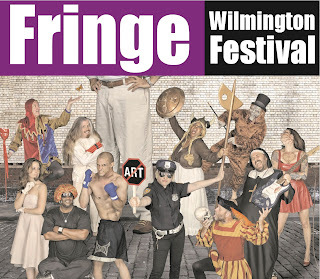 Don't miss Fringe Wilmo 3.0!